Our readers surnames from the County Armagh. 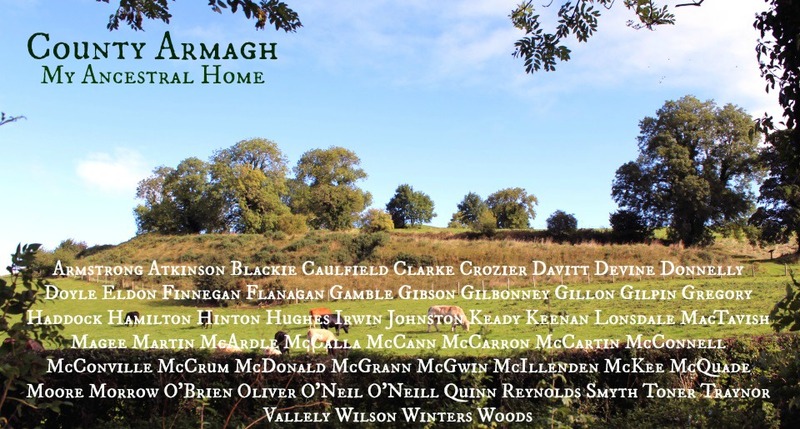 Is your County Armagh surname here? Let me know in the comment section below if you would like yours added. Our “Tribes of Ireland” book is coming out at the end of next month and we are “locking down” our readers names to make sure we include all of your ancestor names for publication. Here is a shot of the Eamhain Macha – or Navan Fort – which gives Armagh its name. Located just outside the City of Armagh. Most of my people came from / are still located in Armagh. Graham on my father’s side and Hunter on my mother’s. Names now added Ken. Mike. Hi Marge – thanks for the feedback – name now added. Mike. I was hoping to find out where the McGrievy’s came from . They emigrated to England and on the census reports they put down Irish Free State only . Hi Dina – name added to list. Have you tried the spelling Connolly which is more usual? Mike. Let me know when your book is available in the States. Fascinating page, keep up the good work! 🙂 My grandfather’s family was from County Armagh and his surname was Kirkland. I was linked to this site via a friend My paternal family name is Emerson and we still have relatives who are there. Could you add the name CARTMILL to your site please? My family came from Grange Parish Loughall. My paternal grandmother had the surname McShane and she was from Loughross/Crossmaglen in Co Armagh. I’d like to see that surname added. The paternal grandfather (surname Maher) was from Rathmacan in Co Kilkenny. They both immigrated separately and ended up in Omaha, Nebraska. Nice to see our family name Oliver listed. Also have Hayes of Co Armagh. g g g grandfather James Hayes. g g grandfather Andrew Bradford Oliver m Mary Jane Hayes and later Anne Hanna. Do try the Irish census records and see what turns up. Thank you for this. My paternal grandfather, Peter Francis Mallon, was from Armagh. I have an ancestor with the surname McKendra who came from Annacramph. My grandparents were Susan mccreesh and alwxandergordon. They were married in Armagh cathedral. Do you include McElree in Londonderry county in your list of original names .? Mom’s many times great grandfather, George McCreary, came over from Armagh in 1775. My understanding is he was Scotts-Irish but haven’t been able to find out much about him. Trying to trace my family name – Dobbin – I have lots if leads – but lots of gaps – know we are linked to Carrickfergus . Dobbin family owned a pub and fishmongers shop in Lurgan Co Armaghuntil late 20th century. My great grandfather, William John Gregson, son of Samuel and Margaret Gregson, came to the U.S. in 1906. He was from a family who, according to the 1901 Census lived in Tullygally, Lurgan Rural, Armagh; and according to the 1911 Census, Drumgor, Kernan, Armagh. Please add Gregson to your site. I will be in Belfast within the next few weeks and have not found the above-mentioned graves. Any ideas? What’s up,I read your new stuff named “The Surnames of County Armagh – A Letter from Ireland” on a regular basis.Your humoristic style is awesome, keep up the good work! And you can look our website about تحميل افلام. Dont see my clan? Lawless or Fay? Still in curran st or the Tunnel Portadown. Our ancestors the Busbys are from County Armagh. The Magees also hail from Strabane, County Tyrone. Nice website. Thanks very much, Loretta – glad you find it useful. Mike. I believe my family (Laughren) immigrated from Armagh in mid 1850’s, I know from some of the history I have read that the Laughren name came up on the tax rolls as early as late 1400’s, early 1500’s. Hamill , Haughian,Lennon,McAlinden family Ames in North Armagh. My great-grandfather Michael Rock owned house 9 in Granemore in 1901, with 13 children! Are there many Rocks in Armagh? Hi there…I note my family surname ‘Morrow’ listed as being a County Armagh surname yet I was of the understanding it was a County Donegal surname?